3Department of Urology, Chinese PLA General Hospital, Beijing, China. Background: The kidneys from donors with rhabdomyolysis and acute kidney injury (AKI) may show discolored appearance. The transplant surgeons may be unwilling to accept a kidney with AKI and black appearance, especially when the kidney is anuric. Method: Fourteen discolored kidneys from 7 deceased donors with severe rhabdomyolysis and AKI were accepted for transplantation at our centers. 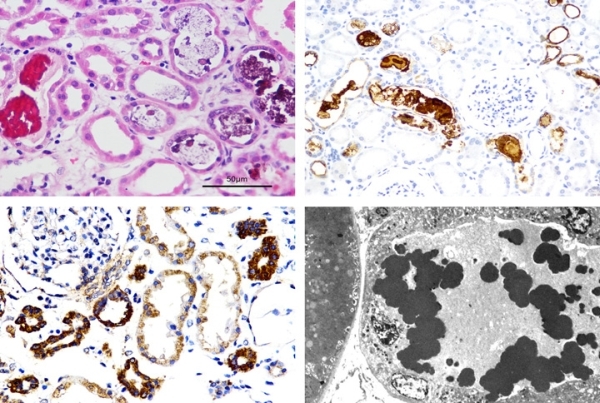 Generally, we accept kidneys with a resistance < 0.4 mmHg/mL/min in pump perfusion when an preimplant biopsy excludes cortical necrosis and chronic lesions (> 10% glomerulosclerosis, interstitial fibrosis, tubular atrophy). The kidney transplant results of 14 black kidneys from rhabdomyolysis donors were compared with those of 30 renal grafts from standard criteria donors (SCD). Results: Two donors received continuous renal replacement therapy due to anuria. The peak serum creatinine kinase (CPK), myoglobin, and serum creatinine of the these donors was 27738 ± 7394 U/L, 76003 ± 50708 [mu]g/L, and 442 ± 214 [mu]mol/L, respectively. Pathological examination showed luminal myoglobin casts or tubular epithelial cell reaction for myoglobin in the absence of luminal casts. The eGFR at 1 years post-transplantation was similar between black kidneys from donors with rhabdomyolysis and SCD (69.8 ± 13.6 ml/min/1.73m2 vs. 71.2 ± 15.1 ml/min/1.73m2, P = 0.56). Conclusion: If the rhabdomyolysis donor has a peak serum CPK > 20 000 U/L and has tea-colored urine, the kidneys are likely to have a black appearance. Discolored kidneys from rhabdomyolysis donors with AKI can achieve excellent graft function, even when the kidneys are anuric. CITATION INFORMATION: Yuan X-.P., CHen C-.B., Zheng Y., Gu X., Zu Q., Wang C., He X. Successful Transplantation of Black Kidneys from Rhabdomyolysis Donors Am J Transplant. 2017;17 (suppl 3). Yuan X-P, CHen C-B, Zheng Y, Gu X, Zu Q, Wang C, He X. Successful Transplantation of Black Kidneys from Rhabdomyolysis Donors [abstract]. https://atcmeetingabstracts.com/abstract/successful-transplantation-of-black-kidneys-from-rhabdomyolysis-donors/. Accessed April 25, 2019.